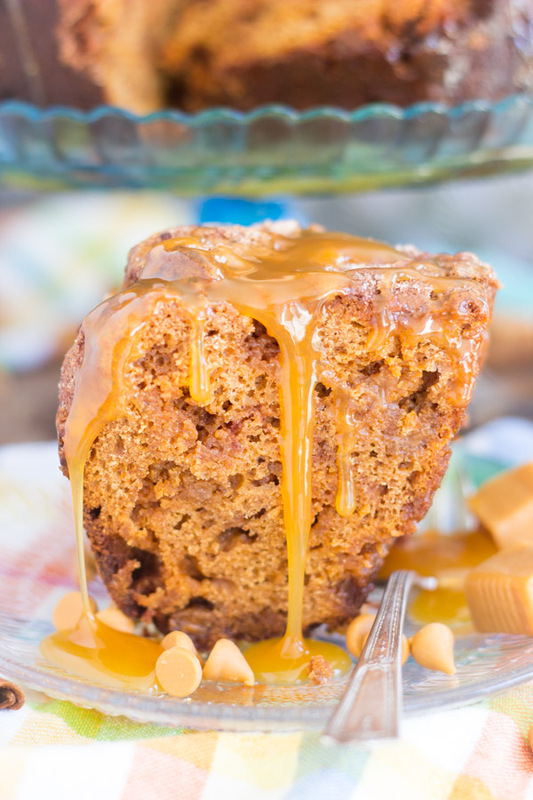 This Butterscotch Caramel Spice Cake Coffee Cake recipe can be prepped in under 10 minutes flat… seriously! 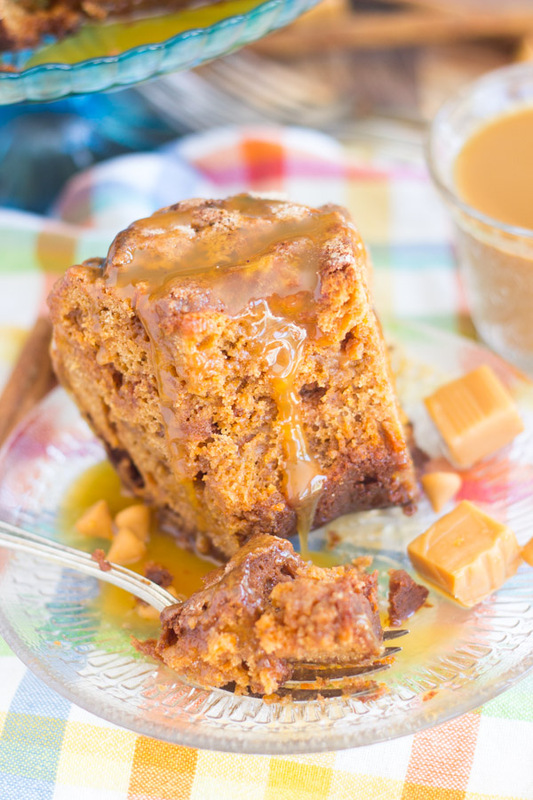 Starts with a spice cake mix, it’s spruced up with butterscotch pudding, full of butterscotch chips and caramel bits, and a boatload of cinnamon-sugar swirl! 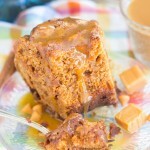 I actually used a bread recipe to create this fluted Butterscotch Caramel Spice Cake Coffee Cake. One of my favorite bread recipes starts with my Grandma’s Pistachio Bread. It’s an old family recipe, and we’ve always considered it more of a cross between bread and cake. Especially since it starts with a cake mix, so it’s a bit sweeter than typical breads. It’s an incredibly versatile recipe, and it’s also extremely simple. You only need a couple ingredients, and you don’t have to use a mixer to whip up the batter. 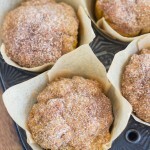 I use the same structure of the recipe to create bundt cakes too, and now, coffee cake. The basic recipe makes for a great coffee cake because it’s dense, moist, and crumby. It’s also a good balance of sweet, but not too sweet. 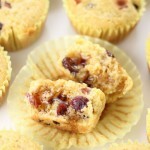 I don’t necessarily want my coffee cake to be like dessert, but I do want it to be sweet. The hallmark of a great coffee cake, and my favorite part, are the ribbons of cinnamon-sugar. 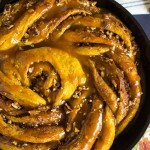 The cinnamon-sugar swirls are generous and abundant in this coffee cake. I nearly double the amount that is used for the Pistachio Bread recipe. I’m a hoarder of baking ingredients, and I had a spice cake mix that was getting past its prime, so I needed to use it. 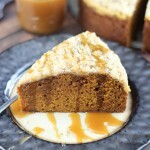 I love spice cake and butterscotch together (see Pumpkin Butterscotch Spice Cake trifle), and this basic recipe uses a box of pudding anyway. I decided to match up spice cake and butterscotch pudding, and then added in some butterscotch chips too. When I use this basic recipe, which I have in a bunch of different variations, I sometimes invert it so that the fluted side is on top, but this one looks prettier with the crunchy and sparkly cinnamon-sugar layer on top. I just liked it better upside-down! Can you blame me? It looks so pretty and tempting with the crystals of sugar. With all of the cinnamon-sugar, spice cake, and butterscotch, you’d think I would’ve felt like this coffee cake had enough going on in the flavor department, but I had 1/2 bag of caramel baking bits left from another recipe, and I decided to toss those in too. I figured it couldn’t hurt. It didn’t. 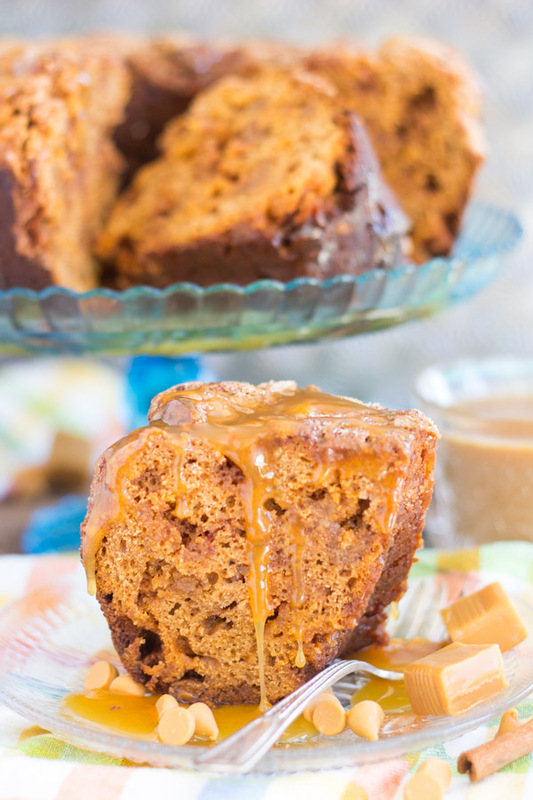 The caramel bits melt into the cake adding bites of gooeyness and stickiness, along with the melty butterscotch chips. 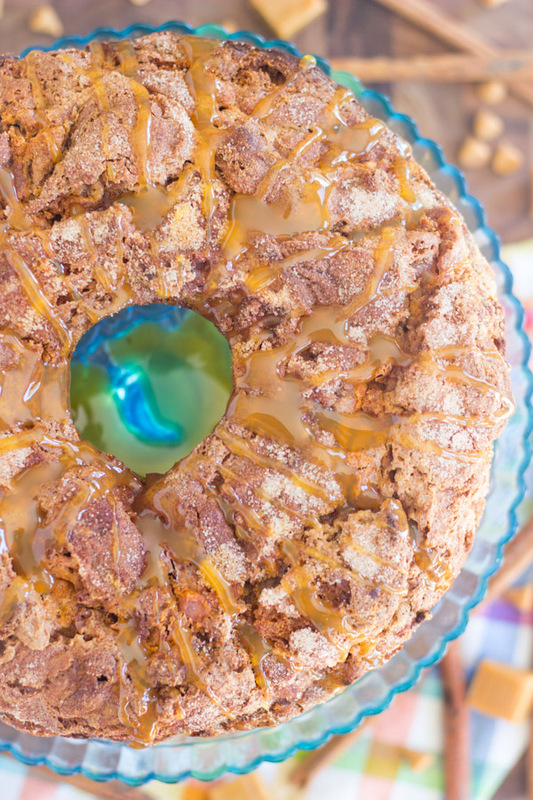 You could drizzle this coffee cake with a little bit of caramel OR butterscotch sauce, or you could leave it as is. It doesn’t need them, but I’m a person that always likes to go one step further. Either way, the flavors are reminiscent of fall, and your weekend brunch will be all the better for including this coffee cake. 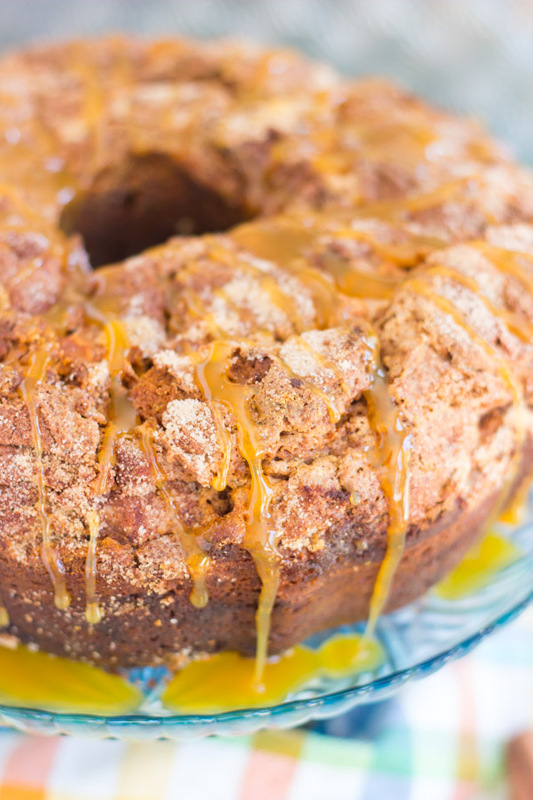 This Butterscotch & Caramel Spice Cake Coffee Cake recipe can be prepped in under 10 minutes flat... seriously! Starts with a spice cake mix, full of butterscotch chips and caramel bits, and a boatload of cinnamon-sugar swirl! 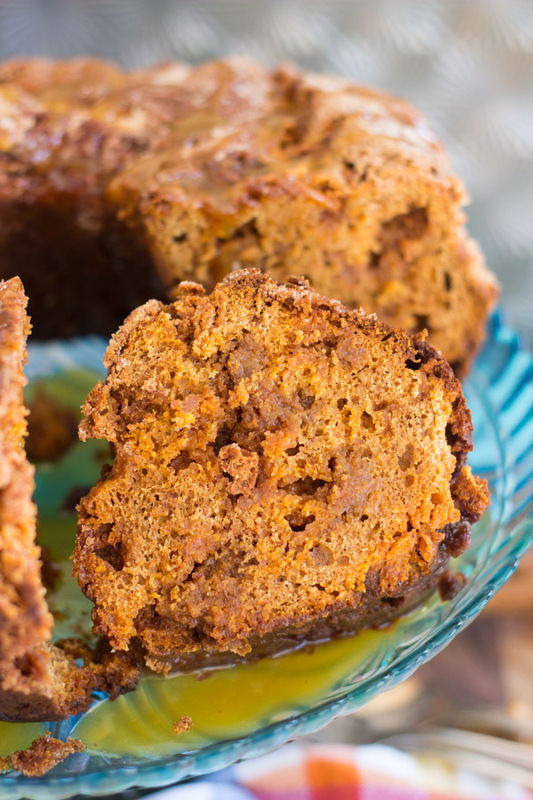 In a large bowl, combine spice cake mix, butterscotch pudding, eggs, sour cream, and oil. Fold in butterscotch chips and caramel bits. In a small bowl, stir together sugar and cinnamon. Spray a large tube pan or bundt pan with non-stick spray. Spread half the batter into the tube pan, and sprinkle with half the cinnamon-sugar mixture. Swirl lightly with a knife. Spread remaining batter into pan, and sprinkle with remaining cinnamon-sugar mixture. Bake at 350 degrees for 40-45 minutes, or until a toothpick inserted near the center comes out clean. Remove to a wire rack to cool for 10 minutes, then invert onto a serving plate. Do not cool completely in the pan - it will stick. 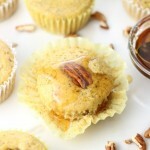 Serve warm with caramel or butterscotch sauce.